Last month I shared with you all both mine and my daughter, Joey's thoughts on the Lalaloopsy Girls Crazy Hair Doll. Well, Lalaloopsy has done it again. This time Joey had the chance to review and play with their latest collection, Lalaloopsy Tinies and she had so much fun! They are adorable and perfect for any child with an active imagination. I have four kids, two of the kids are still young enough to need a great deal of attention, but far enough apart to need much different kinds of attention which can be challenging with a bored 7-year-old and an active 1-year-old. We recently had a rather long appointment for my 13 year-old son and the Lalaloopsy Tinies kept Joey busy so I could run after her baby sister. They are easily portable taking up almost no space in her sister's diaper bag and hours of fun. She has a collection going and is trying to get them all. With over 150+ dolls, she has her work cut out for her. What we also found awesome about these Tinies were that they had hair you could have soft, lanyard hair that you can style! Each set has comes with 5 brightly colored and uniquely named dolls. Also included is a guide that lists all the other available Tinies, which is currently pinned to Joey's wall and all those already collected dolls crossed off. Perfect for any girl that's a fan of Lalaloopsy's or even for those that love starting new collections. Each pack retails for $12.99 and can be found at Toys R Us, Walmart, Loblaws and Sears. Disclosure: All opinions are my own. 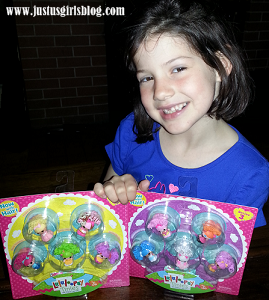 I received Lalaloopsy Tinies at no cost for the purpose of this review. No other compensation was received.